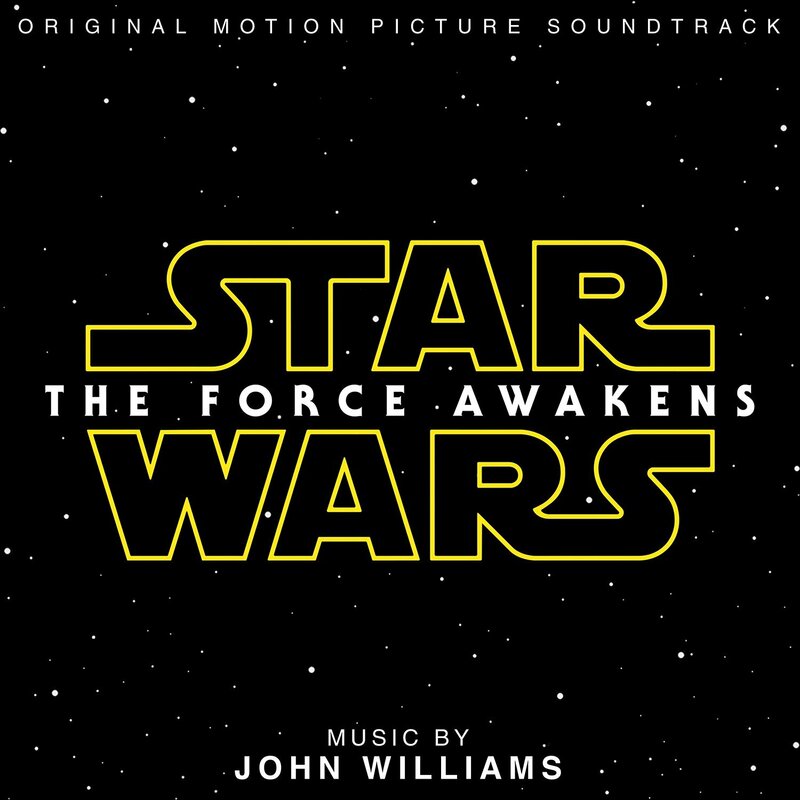 Continuing what he started in 1977, John Williams returns with Star Wars: The Force Awakens. Now the seventh episode in the Star Wars universe, Williams continues his multitudes of themes and builds on ones we’ve heard before. In this review, I plan on going through the Original Soundtrack track by track and highlighting thematic material. While you probably wouldn’t read this without seeing the film in advance, I will do my best to be spoiler-free. For returning themes, we get the Force Theme, Luke’s Theme (Main Titles), Leia’s Theme, Han Solo and the Princess and even the Rebel Fanfare motif. For new themes, we get Rey’s Theme, the villainous Kylo Ren’s Theme, Finn and Poe’s Theme and a new march for our heroes – March of the Resistance. You can find 3 new concert arrangements of his material on the album: Rey’s Theme, March of the Resistance and Scherzo for X-Wings. Starting with Main Title and the Attack on the Jakku Village, the orchestration and performance does seem different to the previously recorded versions but that is to be expected with a new orchestra and scoring location. As the titles transition into the Attack, we start with menacing brass, charging strings and some great trumpet flourishes. After a softer string section, the menace returns before the entrance of Kylo Ren’s Theme. The action writing in this track certainly harkens back to his original trilogy scores but even some new styles heard in the prequel scores. The Scavenger begins with a plaintive English horn solo which feels like a callback to the Dune Sea music from A New Hope. A flute solo introduces the first part of Rey’s Theme (heard in several variations throughout the track). The piano intro has a wistful nature to it before opening up to a full orchestral statement of Rey’s Theme which appears stronger and more willful with each variation. The flute returns again under strings and harp to close out the track. I Can Fly Anything picks up with a rollicking rhythm, more trumpet flourishes, classic Williams bass drum/cymbal crashes and a bold statement of Poe Dameron’s heroic theme. Rey Meets BB-8 is a gentle cue, almost magical and warm with the orchestration used. Follow Me leads with some clarinet solos before being launched into a great action sequence. Finn’s rhythmic motif leads the majority of the track, before a cameo of the Rebel Fanfare ends the cue. The concert suite, Rey’s Theme is not only the standout theme of the film, it’s also a delightful highlight of the album. The theme is worthy of this expanded arrangement, and will probably be making the rounds of concert performance in addition to the other 2 concert suites on the album. The Falcon jumps right into the frenetic action with charging strings and another quote of the Rebel Fanfare (seemingly linked to the Millennium Falcon in the film). Finn’s motif gets added into the fray with strong trumpet lines, matching any of the action cues heard in the original trilogy. That Girl with The Staff features an almost hidden reprise of Rey’s Theme before getting into the intense darkness and suspense of the rest of the cue. Suspense continues in The Rathtars!. Among some of the darker moments, Williams uses racing strings, spinning strings and the percussion ratchet as a musical sound effect. Luke’s Theme makes an appearance as well as Finn’s action motif and ends with a heroic Rebel Fanfare. Finn’s Confession gives the action a rest, and features a lovely warm sound from solo horn and strings with an appearance of Rey’s Theme. Maz’s Counsel contains a bit more mystery with a solo horn playing the film’s first arrival of the Force Theme. At the very end, Rey’s Theme gets a hurried and intense variation. The Starkiller is an emotional piece, similar to some from Revenge of the Sith, focusing on the string section. Kylo Ren Arrives at the Battle returns us to the menacing and sinister Dark Side sounds heard in the opening. Obviously Kylo’s Theme is prominent, with Rey’s Theme appearing on English horn at the close. The Dark Side continues in The Abduction. Among low brass and shrill strings, we see some of the darkest moments in the score. Some striking variations of Kylo and Rey’s Themes appear in this track. Han and Leia brings us a soft flute reprise of Leia’s Theme and a tender reprise of Han Solo and the Princess (their love theme underutilized in both Empire and Jedi). The mood changes with the introduction of the Resistance March, a semi-fugue introduced in the horns. The romantic love theme has another brief reference before adding in a very solemn Force Theme. March of the Resistance, the next concert suite arrangement of the Resistance theme is infectious and worthy of several listens. The bass choir in Snoke has an otherworldly sound, with Williams adapting a poem into Sanskrit (as he had done for Duel of the Fates in Phantom Menace). On the Inside returns us back into a suspense mode, almost hushed at times until we hear the large brass sounds of Kylo Ren’s Theme. Torn Apart is an emotional cue, with emphasis on the strings and low brass. The crescendo midway leads to a slow moving elegy before pitting Kylo’s Theme against a somber Rey’s Theme with the Force Theme making another appearance. The Ways of the Force continue the matching of themes, the Force Theme under swirling strings, completely flipped orchestration of Rey’s Theme in an action setting with Kylo’s Theme still menacing. The Force Theme makes some more strong appearances and Rey’s Theme has yet more variations in orchestration. Scherzo for X-Wings (and yes the title is fitting) has some fanfare-like features, similar to what Williams did for The Adventures of Tintin (2011). Luke’s Theme gets passed around almost joyfully throughout the cue with slight variants each time. A greatly fun piece. Farewell and the Trip is a lovely mixture of Williams’ thematic glossary. Beginning with a determined reprise of Rey’s Theme, it quickly goes into the Force Theme, Han Solo and the Princess, Leia’s Theme. Luke’s Theme also merges with Rey’s Theme, which closes out the track. The Jedi Steps and Finale continue the combined feel of Rey’s Theme and Luke’s Theme. 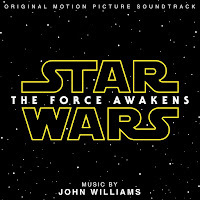 The Force Theme gets the sweeping rendition (or Binary Sunset) we’ve heard in previous films. It crescendos to the “iris in” and leads into the same end title music we’ve heard for each episode. For the credit suite, we hear reprises Rey’s Theme, Kylo Ren’s Theme, Finn’s action motif with an overlay of Poe’s Theme, March of the Resistance, a combination of the Force Theme and Rey’s Theme. One last reprise of Luke’s Theme on celeste ends the credits and the album. What John Williams has created with The Force Awakens is a solid score worthy of the Star Wars legacy. It's amazing that John Williams has been continuing with this franchise since 1977. The bar was set incredibly high with the original trilogy - continually showing up on critics and the public's favorite scores. All three original trilogy scores were Oscar nominees, with only A New Hope taking the prize. In 1999, he returned to the franchise with the prequel trilogy. While the films are often maligned, the scores felt very connected musically. With The Force Awakens, it's the first without director/creator George Lucas, but clearly Williams was able to tap back into that Star Wars mode. His new themes are artfully crafted and balanced throughout the film. On album, you can hear the slight changes to Rey's theme as she goes through her story. His last few films were very introspective and he brought that same touch to the Star Wars universe, letting us get to know the new generation of characters musically. Even with changes like change of director, health issues, long recording process and JJ Abrams’ editing style was able to produce an exceptional score. He should also receive high marks for a strong album presentation – 77 minutes in almost complete chronological order (compared to the prequels confusing order). While there is a bunch of unreleased music (some more can be heard on Disney’s For Your Consideration website), the album features the bulk of the score from the highest action sequences to the emotional core.